Lemax Chimney Sweep Figurine depicts a common site in a bygone era of a traditional Dickensian chimney sweep with ladder kept busy by the many homes that need him. Ideally placed in a dickensian Lemax village street setting. Chimney Sweep is a relatively new arrival joining the collection as a Lemax Village scene figure since 2013. 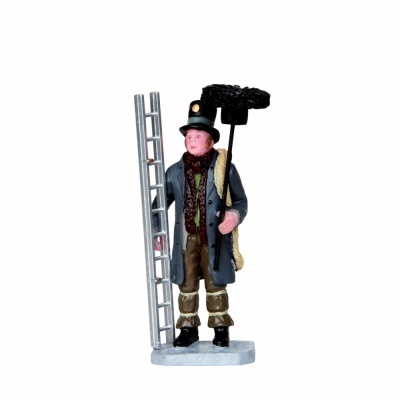 Chimney Sweep is a single individual hand painted polyresin figurine mounted on a single street base to compliment your seasonal Lemax Village Christmas display.